Remember that if a title catches your eye, you can find out where the show is streaming by using this handy search engine. In a sentence: Seven years after the murder of his family, Angelo Lacuza returns to the world of organized crime in order to find the men responsible for their deaths. As with Orange, the Evo gang let me talk about this one in-depth, so you can click here to read all about this prohibition-era gangster drama. In a sentence: GEN UROBUCHI MADE A PUPPET SHOW, WHAT MORE DO YOU EVEN NEED. Premieres this season tended to either meet expectations or disappoint me, so there wasn’t a lot of excitement… until Mahou Ningyo Puppet Magica, anyway. Yes, the writer of Madoka and Psycho-Pass is bringing us a Chinese martial arts fantasy epic (or wuxia) WITH PUPPETS. And it’s my favorite premiere of the season. The puppet action is fast-paced and incredibly choreographed, the story plays out quickly but coherently, and the dialogue is a sincere tribute to the melodrama of the genre with just a touch of cleverness and camp to keep things fresh. Oh, and the villain is voiced by Seki Tomokazu, just to put a cherry on the This Was Made For Me sundae. I spent the entire episode wearing an ear-to-ear grin. This show made me feel like I was 12 again, and I’ve been throwing it at my friends every chance I get. While it’s possible Dark Crystal/Zero could lose its magic over time, considering how giddy the premiere made me, there’s a much higher chance I’ll be bouncing around about this one for the rest of the season. In a sentence: Haruki comes from a family of judo competitors, but a shoulder injury and a best friend with a plan takes his college life in an unexpected direction: Founding a men’s cheerleading club. Still, I wasn’t sure it was for me…and then the guys starting recruiting and landed their first member, an overly-serious awkward turtle who might be my favorite character of the season (so far). I giggled my way through the second act and was thoroughly charmed by the finale. Throw in some basic stats–this is by studio Brain’s Base and director Yoshimura Ai, who gave me the surprisingly great Dance with Devils last fall–and it’s more than earned three episodes. Let’s see if these cheer boys can rah-rah their way into my heart. Judging by my Twitter timeline, I was the only person who watched this and wasn’t completely blown away by it. Don’t get me wrong: the series looks incredible, with great smear-style animation, striking and ambitious artistic techniques (such as this magnificent oil-painted specter), and distinctive, “ugly” character designs that bend and warp to match the show’s own off-kilter mood. And there’s a ton of value in that, and I want to support that kind of artistry. It’s just that the story (about a phony exorcist and the psychic middle schooler nicknamed Mob who handles all the real work) did nothing for me. This is by ONE of One Punch Man fame, and I’m already sensing some of the issues I had with OPM: Over-repetition of jokes, one-note characters, and an almost unrelentingly sarcastic tone. There’s a touch of sincerity and heart in the final few minutes that gives me hope, so I’m going to come back for at least one more episode out of respect for what the animation and art staff are doing. But if the content continues to leave me cold, I might have to bow out here. Are Manic Pixie Dream Girls any better if they show up to fix a girl’s life instead of a guy’s? 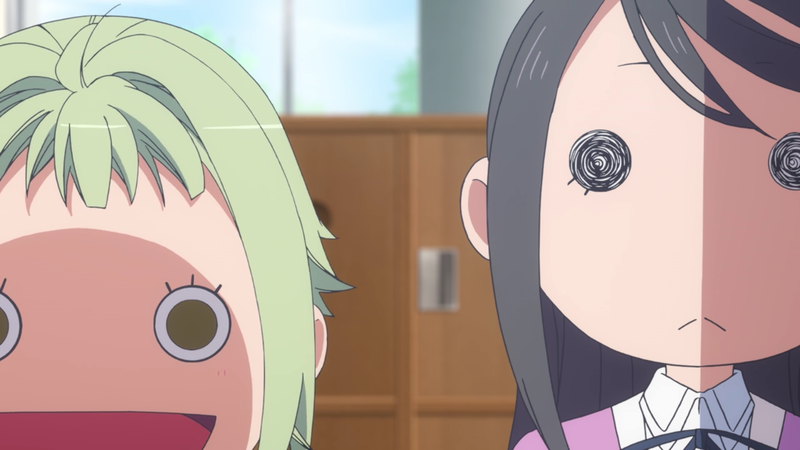 Amanchu, a series about scuba diving girls with some heavy romantic overtones, has moments of beautiful art and direction and can be very weird and silly. It’s filled with goofy faces that toe the line between nightmarish and cute, which gives it a unique style, although by the end of the episode I was a little sick of the girls wearing essentially the same two exaggerated expressions over and over again. It also suffers from Hikari, a “quirky girl” who’s frenzied excitement loses its charm fast, robbing her of any sense of humanity and making her more frightening than fun. By about the midway point I’d decided it was secretly a horror story, and found myself enjoying it a lot more that way. It’s not in the slush pile yet, mostly because I have faith in director Sato Junichi (Sailor Moon, Princess Tutu) and because there were parts that did earn a smile. But unless it tones down the Fairy Faces and starts trying to develop Hikari into an actual character, I doubt I’ll stick with it. Based on a visual novel by Key (Clannad, Kanon), this premiere about a world rocked by war and the service robot faithfully performing her duties in an abandoned planetarium for 30 years is quietly heartbreaking and surprisingly poignant. I’m not sure it counts as a full-length series since it’s a five-episode ONA (online animation) that only clocks in at 18 minutes apiece, but I wanted to at least mention it here since I’m planning to give it a Round Two. If it can maintain this sad, hopeful tone, I’ll be around for the entire (short) run. Not all bad, just not all for me. Although, some? Some are rull bad, too. Handa-kun: Maybe I should’ve included this in my “On the Fence” pile since I did appreciate its portrayal of social anxiety and some of its dialogue. But the jokes were too drawn-out and I don’t have any real attachment to the Barakamon universe, so if my other shows pan out it’s unlikely I’ll have time to try it again. Time Travel Girl: This show about a girl who travels through time meeting famous people, learning about science, and looking for her missing dad would’ve been right at home on the Kids’ WB block of my childhood. If I were a preteen I think I’d have really enjoyed it, so if you have kids in your life, this might be a cute show to watch together. Scar-red Rider Xechs: Packed with made-up terminology and shoddy world-building, this was almost nonsensical enough to be an MST3K-style watch-and-mock. But probably not enough to earn a second look. TSUKIUTA. THE ANIMATION: If you’re going to watch a lackluster boys’ idol show this season, make it B-Project. At least that one has the decency to be occasionally self-aware and silly. Regalia: The Three Sacred Stars: Cute girls and robots and very little else, including decent fight choreography. I lost interest before I could uncover any mysteries, and I’m okay with that. Alderamin on the Sky: An insufferable sexual predator protagonist ruins whatever good will the decent supporting cast and fantasy world premise might have garnered. I bailed once I realized he wasn’t going to fall off the ship and drown any time soon. This Art Club Has a Problem! The art club has lots of problems: Its president sexually harasses his female members, its protagonist has zero chemistry with her alleged crush, and it’s full of stock anime characters. Studio Feel has done a very nice job animating this one, with lots of dynamic expressions and movement. Too bad there’s no content to make it worth the watch. Qualidea Code: I really don’t have the energy to sit through more lone wolf dude protagonists surrounded by girls at a magic school fighting something-or-other. I ducked out fast here. Ange Vierge: Battle girls! Who sure do enjoy wandering around naked covered by censor-approved steam and sunbeams. Uninterested but kind of amused, I decided to stick around until the characters put their clothes back on. And at EIGHTEEN MINUTES, 26 SECONDS, I finally dropped Ange Vierge. Hitorinoshita – The Outcast: This show about false identities, secret organizations, magical powers, and I guess zombies?? could have been such entertaining trash if it had exciting direction and was more willing to go all-out. But it didn’t, so it looks like I’m not getting a good bad show this season after all. Dang. There are a lot of sequels to shows I either never watched (D.Gray Man, Love Live) or started and dropped (Berserk), so it’s a light season for me in that respect. I’ve been too busy to actually watch them yet, but I am planning to try out Season Two of Boueibu (appropriately titled Cute High Earth Defense Club LOVE! LOVE!) and the new Show by Rock!! series. 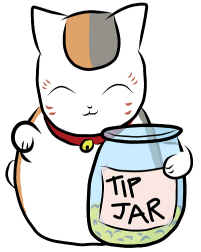 I’m also watching the two-minute short Bananya, because cat bananas are 100% worth two minutes each week. I haven’t had a chance to catch many other shorts yet, so if there’s a good one that I missed, let me know! Josei… thank you so much for wading through the tropes and the fan service and the over-used gags and everything else so that others don’t have to. Those of us who follow you apologize for any Pokemon that went uncaught because of your hard work. Yours is a noble sacrifice. Also I’d have no idea what Thunderbolt Fantasy was if not for you, so thanks! I too was very on the fence about Cheer Boys until the first recruit. The humor was spot on and Tomokazu Sugita was so perfect for the role I was dying when I realized it was him (I know him from Gintama and Sket Dance where his characters are very similar in that “comfortably and unapologetically out of place” way). Holy heck, you tried everything! I’ve got a word in favour of This Art Club Has a Problem. It has a problem, damn yeah, so I’ve got almost the same weird feeling after the first episode and thought about the drop. But its appeared to be almost the only new comedy in my summer watchlist so I decided to give a look to original manga to be sure. And onwards with other characters the story goes much better and inspite of some degree of cheekiness has funny non-fanservice jokes. Not a perfect masterpiece, but kind of nice average comedy. I’ll probably just stick with Cute High Earth Defense Club and Cheer Boys for my comedy anime this season, but good to know it picks up! Hope you enjoy it! I wasn’t blown away by Mob Psycho 100 either. I probably won’t even be following it at all because while I certainly didn’t dislike the premiere, I want to use what little spare time I now have watching shows that do blow me away – or at least, come closer to doing so than this one probably will. I’ve decided to give it three episodes, but I didn’t really care for the 2nd one, either, so its odds of making the watchlist aren’t looking so good right now. There are quite a few promising shows this season, certainly enough to offset the many duds. My two favorites, at least two weeks into the season, are Sweetness & Lightening and 91 Days. I liked how anarchic Mob 100 was, but it was nothing to right home about or on Twitter, for that matter. I might write a blog about it at some point though. Just read all the Sweetness & Lightning manga on Crunchyroll, and without spoiling to much, there is no romance between teacher-student, just an infatuation with a father figure. I really liked Mob Psycho 100, but I also really liked One Punch Man. I really need some Flying Witch healing Anime, so I hope Amanchu can fill that gap, I liked the first episode, but I’m with Josei and hope they tone down the manic behaviour of Hikari. FYI, you can watch Love Live Sunshine without having seen the previous Love Live. I didn’t and I’m enjoying it so far. I got that sense based on what people on Twitter were saying, but… honestly, I’m burned out on premieres and I’m not that into idol shows anyway, so I’m kind of using “it’s a sequel” as an excuse not to have to watch another show. ^^; Maybe I’ll give it a try during the lull between seasons, or after I’ve trimmed a few more shows off my watch list. Thunderbolt Fantasy is so freaking gorgeous. The outfits and the visuals are just amazing. It’s a very different experience from watching more traditial anime. Plus the episode 0 preview was a really interesting look at the behind the scenes stuff. the arguably stand out ‘anime’ this season obviously is Thunderbolt Fantasy indeed. I’m very blown how Urobuchi makes story that typical setting evil vs good tropes become interesting and that dialogue between the black haired mc and the white haired mc in episode 1 is so good make me watching two times again just because the their dialogue. next anime I hope become good too is battery. the interaction between two protagonist in episode 1 is good. Oh, shoot, I still need to watch Battery. I keep forgetting about it because it’s on Amazon and doesn’t pop up on my CR or Funi queues. Thanks for the reminder! Man, I love how Gen goes from Philosophy on God by way of Sengoku period fruit superheroes in Kamen Rider Gaim to Crouching Tiger Hidden Thunderbirds. I think this man is my hero.